PHOENIX (CNS) — A Catholic-founded human rights group that for decades has sought the closing of a U.S. military training school in Georgia has moved its main protest to the U.S.-Mexico border. School of the Americas Watch supporters will gather Oct. 7-10 in Nogales, straddling the border between Arizona and Sonora to demonstrate against “militarization” of the border region and the “criminalization” of refugees and migrants, said SOA Watch national organizer Hendrik Voss. “While we are still very much concerned about the ongoing training of repressive Latin American forces at the (former) School of the Americas, we are also very concerned with the militarization of the U.S.-Mexico border, where hundreds of people die every year as a result of that militarization,” he told Catholic News Service. He said the group also stands against the U.S. detention of Central American migrants who have fled extreme violence and poverty. “We are in solidarity with people who have been incarcerated for no other reason than seeking a better life for themselves and their families,” he said. In 2001, what was the School of the Americas at Fort Benning, Georgia, was technically closed and reopened as the Western Hemisphere Institute for Security Cooperation. It’s a training ground for military, law enforcement and civilian officials from Latin America and the Caribbean. The SOA Watch border protest will start with a demonstration outside the immigrant detention facility in Eloy Oct. 7 and continue with events in Nogales, in Arizona, and Nogales, in the Mexican state of Sonora. An evening interfaith vigil at the border fence will take place Oct. 8. Participants also will have the chance to attend seminars addressing the root causes of migration. “We want to shine a spotlight on the connection between U.S. policy in Latin America and those military and economic policies that force people to flee their home countries,” Voss said. The SOA Watch Border Convergence coincides with anniversary of the death of 16-year-old Jose Antonio Elena Rodriguez in Nogales, Sonora. The Mexican teen was shot and killed by a U.S. Border Patrol agent who fired his weapon through the border fence Oct. 10, 2012. The agent, Lonnie Ray Swartz, was charged with second-degree murder and is awaiting trial. Swartz says he was acting in self-defense against Elena Rodriguez and other rock-throwers on the other side. Since the 2001 terrorist attacks, the Department of Homeland Security has nearly doubled the number of U.S. Border Patrol agents along the Southwest border, from 9,100 in 2001 to 17,500 in 2015. 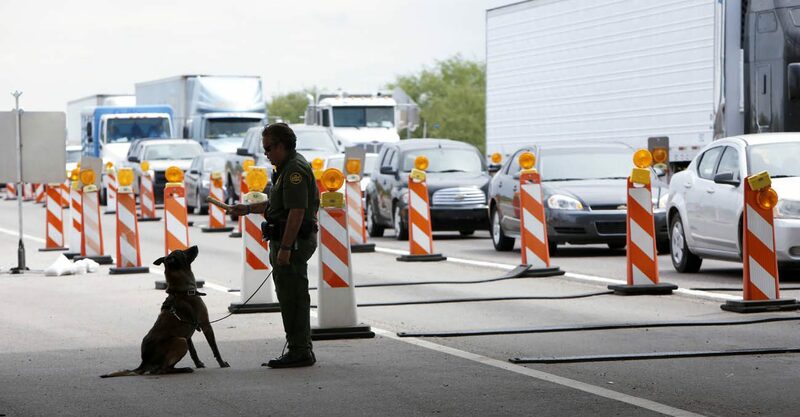 Border Patrol checkpoints now monitor traffic on roads leading to and from border areas in Arizona, Texas, New Mexico and California. Mercy Sister Kathleen Erickson, who has ministered to women and children in U.S. immigration detention facilities for several years, sees the surge in enforcement differently. She said those who come to the U.S. border out of fear and seeking help should not be treated as criminals. Immigration and Customs Enforcement holds an average of 34,000 men, women and children daily in county jails, federal facilities and privately run detention centers, according to the National Immigrant Justice Center. Sister Erickson, who lives in Omaha, Nebraska, said she and seven other members of her community are traveling to Nogales for the SOA Watch demonstration. SOA Watch was founded in 1990 by then-Maryknoll Father Roy Bourgeois following the 1989 massacre of six Jesuit priests, their housekeeper and her daughter during El Salvador’s civil war. Several Salvadoran military officers trained at the School of the Americas, now known as the Western Hemisphere Institute for Security Cooperation, were implicated in the killings. SOA Watch has called for the closure of what is now the Western Hemisphere, saying that it instructs students in the use of torture and other oppressive measures — charges the institute has said are false. According to the institute, it has trained more than 21,000 students — military and law enforcement personnel and civilians — from 36 countries in support of national security strategies in the Western Hemisphere. Its curriculum includes courses on human rights and ethics. Voss said SOA Watch is newly concerned about border agents being trained at the institute. Last year the first Border Patrol member completed an institute course on intelligence operations targeting transnational organized crime. SOA Watch has held an annual protest outside the gates of the Western Hemisphere Institute for Security Cooperation since 1990. In 2006, more than 15,000 people showed for the demonstration. Participants have dwindled to a few hundred in recent years. Voss said the group expects a large showing at the border. More than 400 human rights and justice groups have endorsed the demonstration. “We will be too big to be ignored,” he said. Although SOA Watch has strong Catholic roots, Voss said the organization has grown to include people from all walks of life. Along with members of Catholic religious orders, members of Jewish Voice for Peace and a group called No More Deaths, a ministry of the Unitarian Universalist Church of Tucson, also will participate in the border protest. Bourgeois, the SOA Watch founder and longtime critic of U.S. policy in Latin America, is among speakers scheduled to address the demonstrators. The Vatican dismissed him from the priesthood in 2012 after he refused to withdraw his support for the ordination of women as Catholic priests. While the SOA stands at the Nogales checkpoint, thousands of family members will be standing at the graves of loved ones who were killed by Illegal Immigrants. How do you with a clear conscience ignore to the victims of illegal alien crime? You choose to stand in solidarity with those who voluntarily broke US laws while knowing the risks and repercussions of crossing the border illegally. The victims of illegal alien crime didnt have a choice. The illegal immigration issue is far more reaching than the plight of illegal immigrants and to address one groups suffrage is hypocritical and disappointing. SOA Watch is a militantly Marxist/Communist organization which promotes the heretical Liberation Theology. It has been sanctioned by the Vaticsn, Somewhere in your article, this should have been reported.